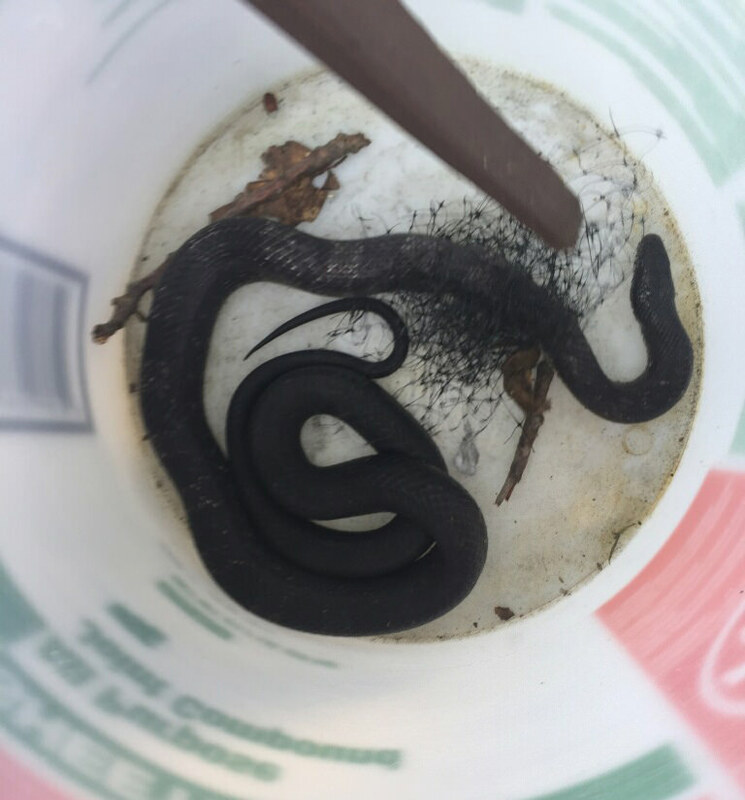 We found this snake in our backyard today. It was stuck in a mesh we use to protect a small fish pond from falling debris. Just wondering if it's dangerous. My kids play in the area where it was found. It is well over a meter in length. It is black on top with a whiteish / silverish belly. I didn't notice any patterns (but maybe we just didn't look carefully enough). The house is in a wooded area of Fairfield County, CT USA. While I cannot identify the snake myself, I would still like to partially answer your main question of "Is it dangerous?" Non-experts can easily misidentify snakes, and even experts can misidentify them if they are not close enough to get bitten. Even if properly identified as a non-venomous snake and deemed non-life-threatening, a snake bite can still be quite harmful and leave you with a nasty infection. You should always treat a snake, as well as other animals of similar danger, as though it is a threat to you no matter what anyone you talk to says about it. There are multiple reasons for that. Some animals, snakes included, have "copy-cat" species which are supposed to fool you. Usually, venomous snakes follow a set of coloring patterns and are identified by that. Even other animals can generally tell the difference between venomous or poisonous animals and non-venomous ones. But some animals are masked, blending in by using the coloring pattern of a different species specifically to fool animals, and by extension us. I went to a venomous snake exhibit recently where someone was fooling people using this very trait to show them how they cannot trust their identification skills if they are not an expert. Even if you are an expert, we were told that some snakes cannot be distinguished for sure unless you are close enough to be bitten. She would show pictures of snakes and then bring out the real snakes, and some of them were nearly indistinguishable from the type they were mimicking; most people failed to identify them correctly even given pictures to reference. Sometimes creatures are moved by humans so that it might not even be a native to your area. First, a friend of mine was bit by an unknown bug. He started swelling but thought little of it since we have no dangerous poisonous creatures native to here. Eventually he had to go to the hospital, and his treatment was delayed since doctors did not know what the source of his problem was. Eventually they figured out it was a spider bite from a spider that hitched a ride from down south. By that time, he head was swollen enough that he was not recognizable, but they did manage to save him. By the time I saw him a week later, he still had a huge bump in one spot on his head and looked awful. All because "we don't have dangerous poisonous/venomous creatures in our area". Second, it was in the news recently in a nearby county that a man was woken from his sleep in the middle of the night by a non-native snake falling on him. "What the ----!?!" you might ask... snakes falling on people in their sleep??? It turned out that he was in an apartment, and the neighbor who lived above him had a pet snake which had escaped its cage in the night, slipped between some floor-boards to get to the room below, and fell on the unsuspecting man while he was sleeping. Who would think they'd have a foreign snake fall on top of them in their home? Creepy. Anyway, point is, it might not be local. Even if it is local and properly identified, it could be more dangerous than you believe. There have been instances of people being severely hurt or even dying when they did not receive an anti-venom because the species of snake was thought to be non-venomous or only mildly venomous. Also, even if not venomous, snake fangs can still mess you up by infection. I once was bit by a snake but thought nothing of it, because "the snakes in this area aren't dangerous." Over the next couple of days the area around the bite got worse. After that, the top layers of skin started falling off and it looked awful and didn't feel good. "Is it dangerous?" depends just as much on how you handle it as it does what species of snake it is. I am not an expert snake handler, but I will share with you what I taught my son. No matter how fast you think you are, you are not fast enough to ensure the snake cannot bite you. Many snakes can execute their strike and bite you before your reaction can even start to move your hand away. If wearing boots and protective leg covering (what constitutes sufficient leg covering varies with the size of the snake and its bite), I will hold the snake down behind its head with my foot, close enough that it cannot wrap its head around to byte at me, then I will grab it at the back of its head with my hand. The snake does not have enough slack to bite my hand because of my foot. Another option: I use sticks to hold the snake in place safely until I can either move it with the sticks or grab it with my hand. Again, grabbing it by hand is something I only do if I can guarantee the snake cannot bite me because of how it is held down. This might not work well with larger snakes; I would probably try it with a medium sized snake like the one you had, but I would not get within striking distance if I did not feel the snake was safely held down. A snake too large to collect by these means I probably would not try to handle myself. If they are big enough, their strike distance might be too far or their constriction might be dangerous by itself. For a snake that I cannot get at with my boot or a stick - the one in your picture looks like it might be oddly placed - I would try to use sticks to pull it out of whatever awkward situation it is in so that I could use my normal tactic. You can also buy special snake handling tools that assist you with moving snakes without touching them with your hands. I am not trying to scare you away from dealing with snakes. Despite what I have said, my son and I still catch snakes as a hobby. Rather I am warning you to be cautious even if you believe it safe; do not be careless in any encounter with any snake. If you grab it, make sure it is not able to strike at you. I looked at Wikipedia, List of snakes of connecticut and the WhatSnakeIsThat listing. Black Racer (Coluber constrictor) - 20 to 60 inches, white, light tan or yellow belly. 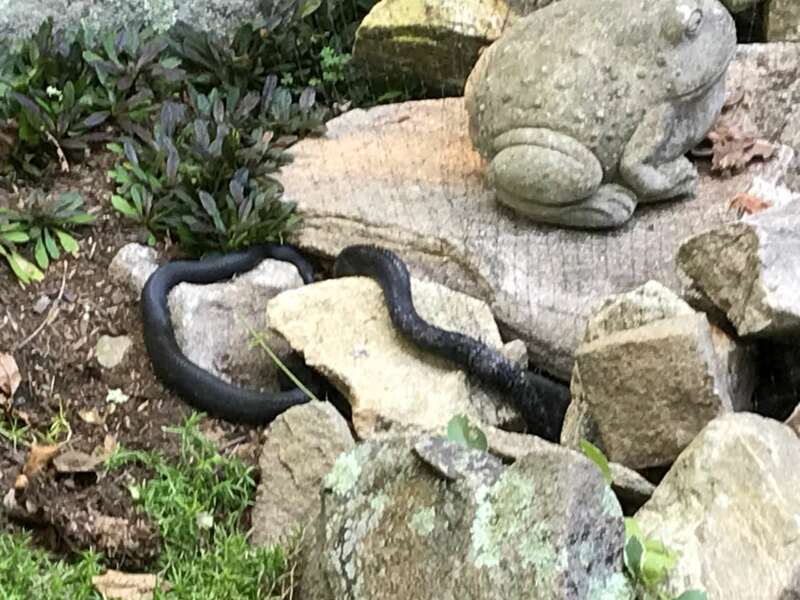 Eastern Ratsnake (Pantherophis alleghaniensis) - 36-72 inches with a black and white checkerboard belly, doesn't sound like the right belly coloring. Northern redbelly - 12 inches and a red belly. Northern Ring-necked Snake (Diadophis punctatus edwardsii) - 15-24 inches at longest, red ring and red belly on body. I'd guess Black Racer/Eastern Racer among those 3 as they can grow to 1 meter and can have a light underbelly. According to the source pages, none of those are poisonous. Northern Water snake , check in Wiki. Black with light belly ( one of the common colors ) , still , harmless unless you are a fish. Based on my experience , he will be back as long as there are fish in the pond. I get Green Water snakes ( also black but don't live in northern states). I have a couple ponds with fish so I have had to kill a few snakes; chasing them away does not work. I don't kill snakes unless they eat my fish. I killed a cottonmouth only by mistake because he looked so much like a Green Water snake. I have very carefully cut a copperhead from the same type of netting. Also a Racer ( not poison but he drew blood- funny video) , then I removed the netting. Not the answer you're looking for? Browse other questions tagged united-states animal-identification snakes or ask your own question. Snake on chest while sleeping? A snake glides over a very rough, hard surface with no signs of discomfort…how? What kind salamander is this black and grey one I found at around 11,000 feet near Mt Ritter in the Sierras? What is this blob found at the edge of a puddle on a forest logging road? How can an adult be bitten by a snake without feeling it? Can anyone identify this small black swimming creature?